I MET ARLENE BARRO by phone in the sweltering Atlanta summer of 1998. I was involved in a launch of a massive health web site that would eventually become the juggernaut now known as webmd.com with 31 million monthly visitors. I was the editor-in-chief, and the chairman had handed me the job of launching thirty channels of comprehensive, accurate, credible content for the general public, for physicians, and for nurses. With that kind of deadline, you cannot recruit great candidates on your own. You need help. That�s when Arlene Barro rode into my life on her white horse. She was the Right Fit at exactly the right time for WebMD�s establishment and growth. Over the first few weeks, Dr. Barro walked me through her method, which she had named the Right Fit. We talked at great length and arrived at a blueprint of the Right Fit for different positions that were open. I was looking for doctors, nurses, writers, editors, and, in one case, a division president outside the United States. Over the next two years, I hired forty candidates from Dr. Barro, my exclusive search consultant. She filled the openings on my staff in three countries. The Right Fit Method worked for WebMD�s growth in the United States, the United Kingdom, and Canada. I couldn�t believe that almost every candidate she presented to me was, in fact, the Right Fit. I didn�t need to see lots of candidates and select the �best� among them,and I saved an enormous amount of time. With Dr. Barro�s help,we were able to find and hire high-level personnel. Without those Right Fit candidates, I would not have been successful. The quality and character of the hires matched my blueprint for growth plans extremely well. Together, we built WebMD to its current status as the Internet�s most visited healthcare site with 230 million page views per month. 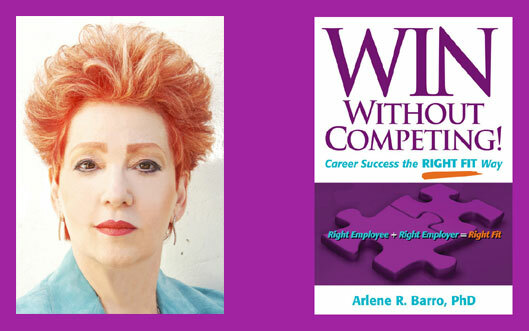 I�ve had the good fortune to have read the early drafts of WIN Without Competing!, and I have read with great pleasure this unique, innovative, and challenging business-career book. It teaches candidates and employees how to implement the Right Fit Method step-by-step. At the same time, they can peek into the minds of employers and get a valuable sense of how those executives think and act. The result: Candidates learn how to make the most of a proven method for career success. And employers learn how to use the Right Fit Method to hire perfect candidates and save time and money, as I did, seldom needing to fire and re-hire. They do it right the first time when they�re armed with the Right Fit Method. For everyone on both sides of the table, strategy replaces stress�the Right Fit Way. I highly recommend WIN Without Competing! to candidates, employees, and employers.